The Vickers Medium Mk. II is a British tier 2 medium tank. The Mark II uses the same chassis as the Mark I. It boasts a top speed of 40 km/h, but in practice the actual speed it can reach on flat ground remains similar to the Mark I. What the Mark II is really about is a bigger gun. The Vickers Medium Mk. II leads to the Vickers Medium Mk. III. As the name implies, the Medium Mk. II is very much simply an improved Medium Mk. I. Stock, there is no noticeable difference between the Mk. II and a fully upgraded Mk. I. The armor isn't any more effective. At a mere 8 mm maximum thickness (a whopping 33% increase over the Mk. I! ), it is utterly incapable of withstanding even the smallest guns in the game, no matter how much one may try to angle it. The final QF 6-pdr 8 cwt Mk. I gun is a considerable improvement over the Mk. II gun used by the Medium Mk. I. It is the most powerful gun available to any Tier II tank (excluding tank destroyers and SPGs) and can be a serious threat to even Tier III tanks. The accuracy leaves something to be desired, unfortunately, and it is not the most reliable of weapons at long range. The 3-pdr Mk. II is somewhat more accurate, but is otherwise inferior in all other respects, and is not recommended over the 6-pdr. Even with the best engine, the Medium Mk. II has underwhelming mobility, comparable to that of the Mk. I, and does not handle very well. Despite supposedly having a top speed of 40 km/h, it simply doesn't have enough power to achieve that on flat ground. The combination of atrocious armor and mediocre mobility means that the Medium Mk. 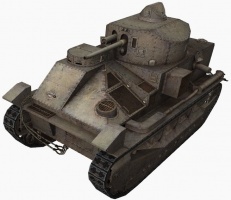 II must be played very carefully, for if it is caught without cover, it will be very quickly destroyed, especially since Tiers II and III are rife with fast-firing autocannons. It is very much a medium-range support tank, and should generally avoid leading attacks. The inaccuracy of the powerful gun also restricts its effectiveness as a sniper, so camping too far back is generally not recommended. The Armstrong Siddeley V8 SC engine and the QF 6 pdr 8cwt Mk. II gun carry over from the Mark I and can be equipped immediately. From here you can either research the Sunbeam Amazon engine first or else research the second turret and the OQF 3-pdr Gun Mk. II. Next you will need to research the upgraded suspension in order to add whichever of the above you didn't do yet. You can research the WS No. 11 radio at any time since it has the same weight as the WS No. 14. 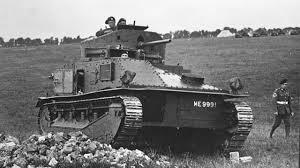 The Vickers Medium Mark II was a British tank built by Vickers in the Inter-war period. The Medium Mark II, derived from the Vickers Medium Mark I, was developed to replace the last of the Medium Mark Cs still in use. Production and rebuilding ran from 1925 until 1934. The tank was phased out of service from 1939, replaced by the Cruiser Mk I. It featured several improvements over the Vickers Mark I : a higher superstructure with the driver's vizor on top of it instead of in front of it; an improved suspension protected by armour skirts; and Rackham clutches, providing a primitive form of mechanical servo-control. Due to a slightly higher weight its rated speed was somewhat slower than that of the Medium Mark I, at 13 mph compared to 15 mph. The Mark II used the same chassis, suspension and transmission as the Medium Mark I but had a new superstructure. The Mark II was equipped with a 3 pdr gun and 4 machine guns in the turret. The back of the turret had a slope so that the machine gun there could be used against aircraft. There were two Vickers machine guns, one in each side of the hull to the rear. The Vickers Medium Mark II and its predecessor the Vickers Medium Mark I replaced some of the Mark V heavy tanks. Both tanks equipped the Royal Tank Regiments until they were phased out starting in 1938. In November 1939, some Medium Mark IIs were sent to Egypt for experiments being conducted by Major-General Sir Percy Hobart and his Mobile Division (Egypt), but the Vickers Mediums in Egypt were also phased out before Italy declared war in June 1940. The Mediums were used for initial instruction in driver training. During the threat of German invasion of the summer of 1940, some of these outmoded vehicles were reactivated for a short time. 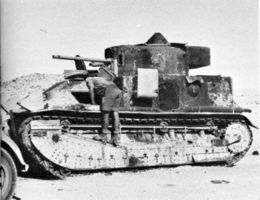 No "mobile" Vickers Mediums faced the Italian invasion of Egypt in September 1940, but at least one was dug in as an armoured pillbox in the British defenses at Mersa Matruh at the time of the invasion. Mark II: the original version of which a hundred were built. Mark II*: Fifty-six of the same vehicles with the Hotchkiss machine guns removed, a coaxial Vickers machine gun added and the commander's post shifted somewhat further back as in the original position he had been in a very real danger of being hit in the stomach by spent shells ejected by the main gun's breech block! Mark IIA: Twenty vehicles newly built in 1930. The bevel was removed from the rear of the turret and an armoured electrical ventilator fan added on the left side. 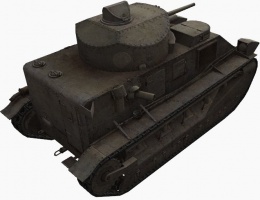 Mark II**: in 1932 the remaining 44 Mark II's were brought to Mark II* standard; in addition a wireless set was fitted in an armoured container at the back of the turret. the weight rose to 13.5 short tons. Mark IIA*: the twenty Mark IIA's brought to Mark II** standard. 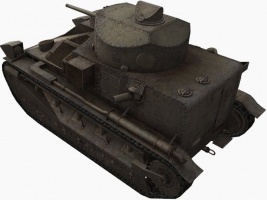 Medium Mark II Tropical: in 1928 five tanks were shipped to Egypt. They were modified by fitting insulation against the heat, such as spaced asbestos plates on the upper surfaces. Mark IIA CS: the Mark IIAs were later rebuilt as close support vehicles, their main armament replaced by a 15-pounder 3.7 inch mortar, mainly intended to give smoke cover, though in practice some HE shells were carried. Each company was equipped with two of these vehicles. The weight was increased to 14 tons. Mark D : the Vickers Mk. D was a one-off design built for the Irish Free State and delivered in 1929. It had a more powerful, water cooled, rear mounted, 6-cylinder Sunbeam Amazon petrol engine, developing 170 bhp at 2100 rpm. A 6 pdr gun was fitted and as many as 4 Vickers .303 machine guns. 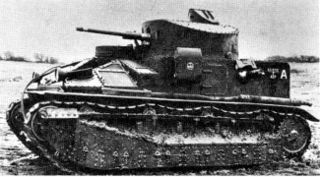 The tank was scrapped in 1940. Medium II Bridgecarrier: an experimental project to convert any Mark II optionally into a bridgecarrier by fitting the bridge girders to the vehicle together with a contraption to launch the bridge when finished. This proposal was not adopted. Medium II Female: Under the command of Lieutenant J.T. Crocker in 1927 two tanks were built for the Indian Government. The turret had no main gun but four Vickers machine guns. Although they were in fact Medium II's and always called that way, their official designation was Tank Light Mark IA Special (L) India. Medium II Box Tank: This was a single command tank, converted from a Medium II in 1928, by removing the turret from the fighting compartment and fitting a large rectangular superstructure. Its only armament was a single machine gun in a ballmounting in the front of that armoured box. Two radio sets were fitted: a short range set for tactical communication and a long range one to contact higher levels. The Box tank was first used by a battalion commander and from 1931 by the Brigade Commander. Medium Mark II* Special: in 1929 four vehicles were built for Australia with the coaxial machine gun to the left of the main gun and an additional Vickers machine gun in the right side of the turret. 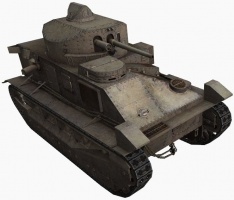 Medium Mark II* Command Tank: in 1931 another command tank was created for the Tank Brigade by replacing the main armament by a dummy gun, fixing the turret in place and fitting an additional wireless set in the space thus gained. English Workman: the nickname given by the Russians to 15 (or 16) Vickers Medium Mk.IIs purchased in 1931. This variant had no cupola, less pronounced turret bevels, and cowled ventilation fans on the hull sides. About half a dozen were found without engines or guns by Finnish forces near Vitele in autumn 1941 during the Continuation War. Birch Gun: three prototypes built between 1926 and 1929 of a self-propelled gun for the experiments then conducted in the field of mechanised warfare. The Mark I had the Ordnance QF 18 pounder, The Mark II chassis was lengthened and fitted with an 75 mm gun on a mounting capable of high elevations. This page was last modified on 21 February 2017, at 21:15.